Geovert’s new 18m telescopic high reach all terrain remote controlled drill is about to be delivered for duty at the Newmont Boddington Gold Mine. This bespoke piece of plant has been specially designed to meet the stringent requirements for Ground Support at NBG. We are very proud of this product as it showcases the shared vision of NBG in combination with Geovert’s expertise as a leader in the field of ground support services. 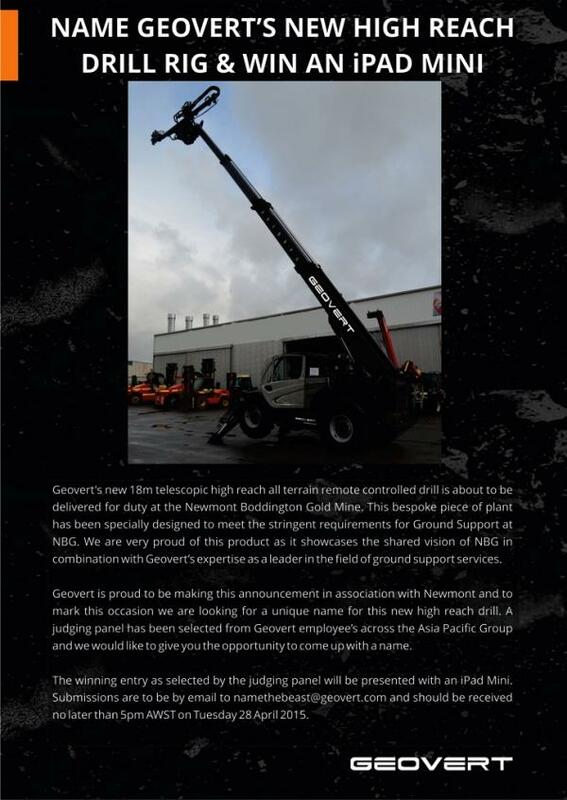 Geovert is proud to be making this announcement in association with Newmont and to mark this occasion we are looking for a unique name for this new high reach drill. A judging panel has been selected from Geovert employee’s across the Asia Pacific Group and we would like to give you the opportunity to come up with a name. The winning entry as selected by the judging panel will be presented with an iPad Mini. Submissions are to be by email to namethebeast@geovert.com and should be received no later than 5pm AWST on Tuesday 28 April 2015.